I was commissioned to make a special birthday card for a much loved granddaughter and was asked to include a favourite photo of said granddaughter. Don't adjust your set! I blurred the facial features on the image. I made a copy of the photograph, reducing it by 25% so that it would fit within the oval framelit. I stamped the flowers with Cajun Craze ink and punched them out with the matching Blossom Builder Punch. Having glued them together, I adhered them to the card front with Stampin' Dimensionals. The enamel tear drop shape with the little heart is from the Good Vibes Project Life Accessories Kit. The flower stems are simply very narrow strips of cardstock. 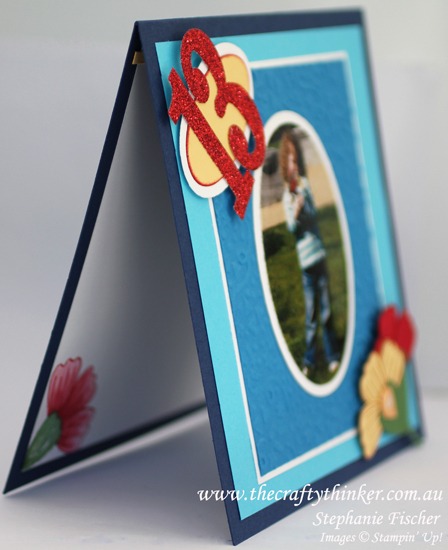 Stampin' Dimensionals provide depth and interest to a card front. The 6" square card is made from Night of Navy cardstock layered with Tempting Turquoise, Whisper White and Pacific Point. I picked out colours that I saw in the photo. The Pacific Point layer is embossed with the Confetti embossing folder. Plenty of space inside for loving, grandmotherly words! To decorate the inside of the card, I used a little masking to create the flower with the Bunch of Blossoms stamp set with Garden Green and Real Red ink. I added a little watercolouring. 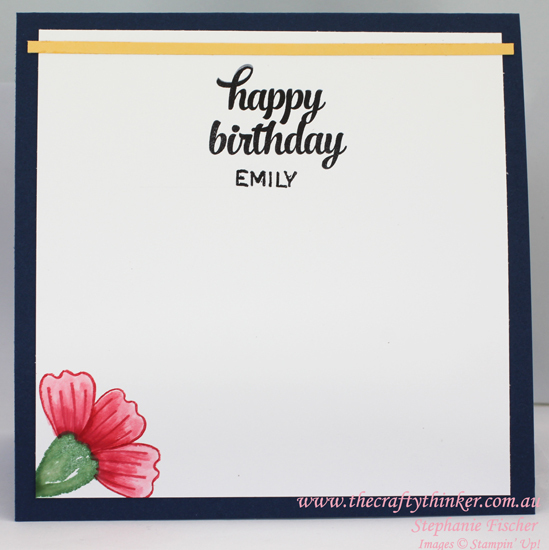 The greeting is from the Tin of Cards stamp set and I added the name using the Labeler Alphabel stamps. I added the very thin strip of So Saffron cardstock because I felt it created better balance.